Organizers estimate Pamplona's Running of the Bulls festival (July 6-14, 2008) will attract over a million revelers, many of them Americans. Spyns, Pamplona's leading tour company, launches new website to inform potential runners about Europe's most dangerous tradition. Running with the bulls is a once-in-a-lifetime thrill but we also want our clients to understand the risk. Demand to run with the bulls continues to grow unabated, says Spyns a leading Pamplona tour company, despite a global economic slowdown. Every year from July 6-14, the sleepy town of Pamplona hosts the San Fermin festival with its famous bulls running every morning after July 7 but running can be dangerous. The bull run is a half mile course through the narrow cobblestone streets of old Pamplona. Fifteen bulls, some weighing over a ton, run in two waves and injuries are commonplace. But as more people try to run with the bulls (as many as 3500 per day on peak days) overcrowding is becoming a problem. As a result, many locals no longer run. Is running with the bulls dangerous? "Absolutely," says Ryan King, President of Spyns, Pamplona's leading tour company. "Clients quickly learn that watching footage of the bull run on our website and actually running are two very different things." An experienced bull runner, King has been leading tours to Pamplona since 2004. "Demand for our Pamplona tours has grown substantially and we've responded by creating two new websites with more information about what to expect: http://www.pamplona-spain.com and http://www.running-of-the-bulls.com." King ensures that his clients walk the entire bull run with a guide and watch it from the safety of Spyns' private balcony before deciding whether to run. "Running with the bulls is a once-in-a-lifetime thrill but we also want our clients to understand the risk." The festival started in 1591 to honor Pamplona's patron Saint Fermin, martyred when the Romans tied him to a bull to be dragged to his death. Eventually a week-long festival commemorated his feast day complete with evening bullfights. Shepherds drove the bulls through Pamplona and this run behind the bulls eventually became running in front of them. Author Ernest Hemingway visited Pamplona in the 1920s and famously wrote about the bull run in "The Sun Also Rises". Overnight San Fermin became an international sensation and the crowds have grown bigger every year. Held every year July 6-14, anyone can run with 15 charging bulls during seven morning runs. For additional information about Pamplona's running of the bulls, please contact Ryan King tel.1-888-825-4720 or visit http://www.pamplona-spain.com / http://www.running-of-the-bulls.com. 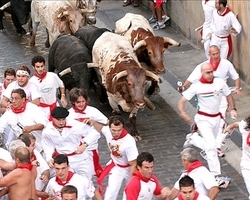 Spyns is an active travel company offering luxury tours to Pamplona's Running of the Bulls. Guests can choose from two, three, and four-day guided packages including hotel, meals, balconies to see the bull runs, and bullfighting tickets. Spyns also offers cycling tours to France, Ireland, Italy and Morocco.